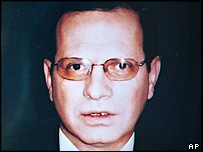 Egypt has confirmed its ambassador to Iraq has been killed, five days after he was kidnapped in Baghdad. An internet message purportedly from Abu Musab al-Zarqawi's militant group was released on Thursday, claiming Ihab al-Sherif had been killed. A video on the website showed a blindfolded man who identified himself as Mr Sherif saying he had worked at Egyptian embassies in Iraq and Israel. Cairo is an ally of the US and Iraqi governments. Egyptian President Hosni Mubarak offered his condolences to Mr Sherif's family and said his government would not be deterred from supporting Iraq. Top Sunni cleric Mohamed Sayed Tantawi condemned the killing as a "crime against religion, morality and humanity and a crime that goes against honour and chivalry". But opposition leaders blamed the government saying it had been hasty in sending him to Iraq and had done it to please Washington. "His blood is on the hands of those who sent him to Iraq at this time," Dia el-Din Dawoud, leader of the Arab nationalist and leftist Nasserite Party told Reuters news agency. "Egypt wanted to stand out by sending the first Arab ambassador to Iraq, but as long as our policies do not spring from our national and Arab interests, this will be the outcome." Muslim Brotherhood deputy leader Mohamed Habib said that while the killing was incompatible with Islam, the US occupation of Iraq was the main reason for it. Mr Sherif was abducted in Baghdad on Saturday. ID cards bearing his name appeared on a website on Wednesday. A statement also released on Wednesday in the name of al-Qaeda in Iraq said Mr Sherif would be killed because he was an "apostate", who had betrayed his faith. It criticised the Cairo government for its support of the US and Iraqi administrations. Al-Qaeda claims to have beheaded several foreign hostages in Iraq under the leadership of Zarqawi, a Jordanian fugitive. A written statement on the website on Thursday said "the verdict of God against the ambassador of the infidels, the ambassador of Egypt, has been carried out". According to the statement, Mr Sherif's captors had recorded his "confessions" and planned to release them later. No images of Mr Sherif's killing were shown. It is unclear on what basis the Egyptian government has become convinced that he is dead. Mr Sherif had been in Baghdad since early June. The statement said the group had been planning to abduct more foreign envoys in Iraq. "The reason we delayed the announcement of capturing the ambassador of the dictator Egypt was to be able to capture as many ambassadors as we can," it said. Bahrain's envoy to Baghdad was hurt in an attack by gunmen earlier this week. The Pakistani envoy to Iraq escaped unhurt after gunmen attacked his vehicle.